On a plane, you’re pretty much out of luck if your battery runs out. That’s not that bad on say a 2 hour trip, but if you’re going cross country, you’ll end up being pretty bored by the end of the trip unless you carry around an extra battery. You might’ve noticed that a lot of airplane seats have a little power plugs underneath them, but this is no normal plug, it requires some special plug. Most people don’t carry these things around with them; they probably don’t even know the exist. Wouldn’t it be great if there was a gadget that let you plug in a normal plug into the airline’s power port? Oh, there is. Look to the left. It may be a bit bulky, but it’s functionality can’t be beat. The 120 Watt Auto-Airline Inverter won’t dock your iPod, dance to your music, or record TV, but it will convert that airline seat power into something your favorite electronic device can use. Yep, you can plug in your laptop, cell phone, iPod, MP3 player, DVD player, lamp (not sure why though), etc. Pretty much anything that will fit into a 3 prong AC outlet works. It does have one more use actually. It’ll also work in your car’s cigarette lighter. 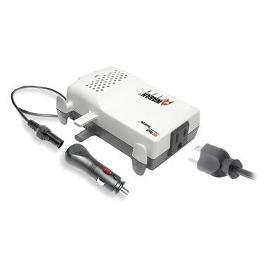 That way you can have power on those long car trips as well as the plane trips. For $60 you can entertain (or entertain someone) for as long as you want in the car or plane. And for any UK people, sorry, looks like this is a US product only. Crikey still no Mac tablet,,, or will there be?